Have you ever thought of creating an app as a way of winning new customers or enhancing the experience of existing clients? We have thought about it, but haven't done it (yet) because app development still seems to be too techy, too complicated and too expensive. It's the preserve of big businesses and West Coast start ups isn't it? Then today, I discovered Kinetise.com. They claim to make it possible for anyone to make an app. 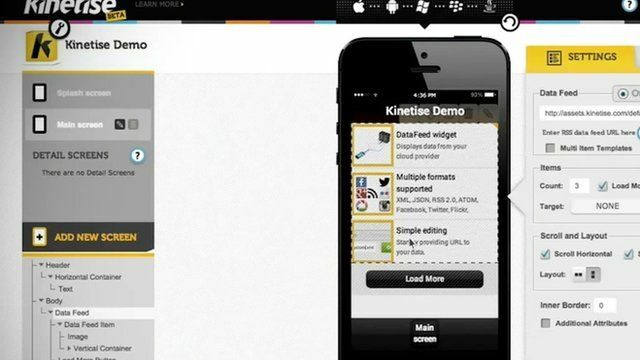 You can build your own app using the Kinetise system and have it compiled and published to all the major app stores including Apple, Google and Windows. They will charge you a one-off fee of $999 to do this. Not a small amount to be sure, but much much less than going down a bespoke app development route. Still not convinced? Then try this: they claim to have recreated the Facebook app from scratch in just 16 hours. Watch the BBC interview below for more. One app company claims it can drastically reduce the coding time needed to develop a mobile app to 15 minutes. Kinetise says its app-building software uses drag and drop functionality to allow simultaneous publishing to the five most popular app platforms, including Android and iOS. But is the $1,000 app really worth it?